Before I left for my vacation, I got a package in the mail from the folks at Pixi Beauty. 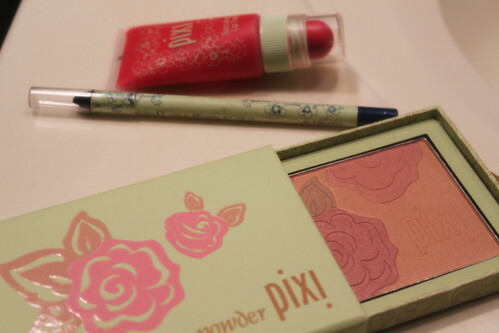 You probably know Pixi Beauty because their products are sold at Target in the cute green packaging with flowers all over. I’ve walked by their items as I’ve browsed the beauty isles but never picked anything up, sometimes I just don’t even know where to begin with a brand that is new to me. Well the kind folks at Pixi sent over the Endless Silky Eye Pen in black blue, the Succulent Lip Twin in red poppy and the very beautifully packaged Lumi Lux Radiance Powder. Over the last few weeks I’ve had the chance to test out all three, and I have to say I’m pretty impressed. My favorite in the bunch? The Lip Twin! It’s a 2 part product, a gorgeous lip and cheek stain is the little ball on the top and in the tube is a great non-sticky tinted balm. The stain is absolute perfect. Truly. It is a soft balm that places the most gorgeous flush of color on your lips without drying them out. 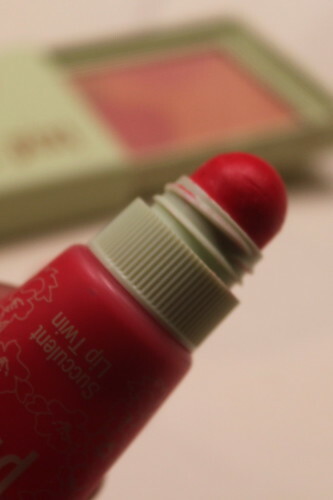 And the balm in the tube adds a bit more gloss to it but really, you can choose either or, or combine them both. The Silky Eye Pen lives up to it’s name and is a great silky eye liner that doesn’t drag across the lid, glides smoothly over your waterline and didn’t smudge or fade. I loved the black and blue, it had such a great deep pigment to it and wasn’t as harsh as deep black liner. I wore it almost daily while in San Francisco. Once I put it on, I couldn’t stop pulling it out of my beauty bag. I also thought the black blue against my brown eyes really made them POP! And last but not least, the Lumi Lux Radiance Powder is a treat to add to your makeup kit. I thought it added a soft glow to my skin and I used it as a highlighter on my cheeks and brow bone. Now that I’ve tested out a few of their products, I find myself browsing their website thinking about what I need to purchase! Their primers and eye brighteners are calling my name…as well as a few more eyeliners. You can definitely follow Pixi Beauty on Twitter and check out their website for more information on products. Have any of you guys picked up any Pixi products? Oooh! Nice…I’m going to have to check them out. I’ve always walked right on by at Target thinking the packaging was cute, but never tried it. Being the makeup junkie I am, I need to! I LURVE their eyeliner. It’s so soft and smooth, it’s like perfection. Seriously! Now I want to try the rest!